In the year 1880, Helen Keller and W.C. Fields were born. James Garfield became the 20th President of the United States, defeating Winfield S. Hancock. 132 years ago, Commander’s Palace also opened its stately doors in the Garden District of New Orleans, a mostly residential, Victorian home and grand tree lined area, a far cry from the cramped French Quarter. 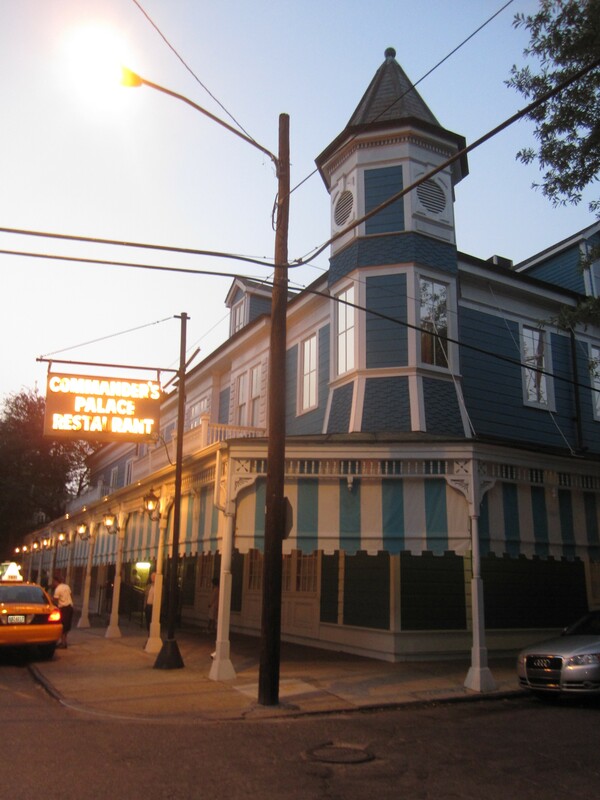 The name Commander’s Palace is synonymous with New Orleans fine dining. It is a true destination for a special occasion night out, not just the place to go when you don’t feel like cooking. In this day of quinoa, foraged vegetables, Niman Ranch this, Coleman Farms that, sous-vide duck breast, and de-constructed s’mores, they just don’t make them like Commander’s Palace anymore. New Orleans is one of the few gifted cities to not need to preserve its dining past because so many of its century old establishments are still running. Some of them are running on fumes and more comparable to an antique by recent visits (Galatoire’s), while Commander’s Palace continues to push itself to a rare level of excellence that blends equal triumph in the cuisine, the elegant sprawling former plantation atmosphere, and some of the most gracious hospitality that exists in 2012. It’s hard to say which is the leading part of that trio for Commander’s Palace. Instead, it should be acknowledged that the restaurant achieves the dining version of the horse racing Triple Crown, complete with steep prices that cannot really be considered steep when comparing to the competition. Very few visitors actually know why Commander’s Palace is called what it is. The story is simple. The restaurant’s founder in 1880 was Emile Commander. No, the restaurant is not named for some military commander or in honor of Andrew Jackson or other fables such as those. Then in 1974 the famed first family of New Orleans restaurants, the Brennan’s, took the helm at even then was considered the Queen of New Orleans dining. The layout could be mapped out like a grand resort or palace if you will, with enough kitchen and dining space for up to 1,000 covers in a day. When you tour the grounds after a meal, then you can realize just how massive the operation is, easily one of the largest non-chain restaurants in the country. The entrance feels more like Lawry’s on La Cienega in Los Angeles than Garden District, New Orleans, with the flashy marquee, and the constant departure and arrival of guests via that quintessential Southern California staple, valet parking. A small brigade greets you then at the door to lead you to one of four potential dining areas. The furthest away, beyond the kitchen resides the garden room, quite possibly the most magical of the rooms with its handsome trellises. Between the main building and the garden room is the garden terrace itself, overlooking the garden that grows some of the kitchen’s ingredients, and the massive kitchen that grows to be more intense at rush hour than Times Square. 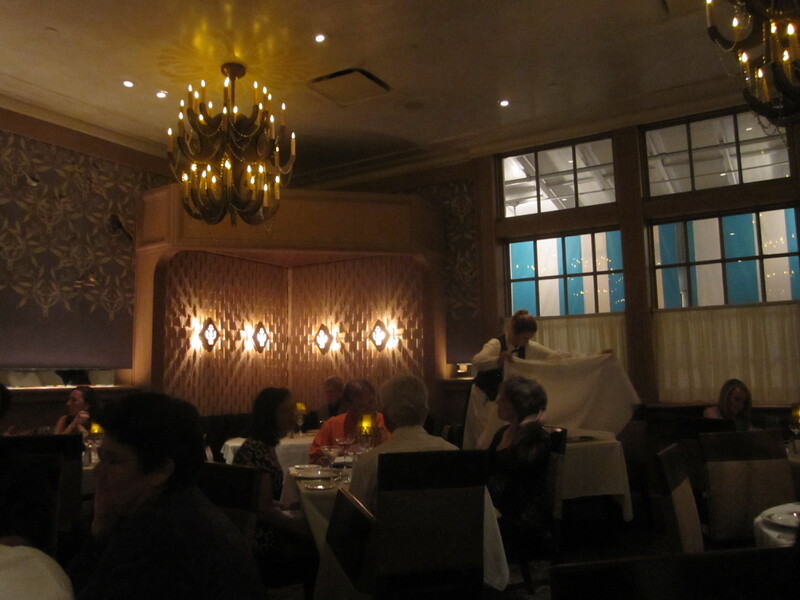 The main dining building consists of an upstairs salon, the quietest and most intimate of the venues, and the main downstairs dining room with its handsome columns, crisp linens, chandeliers, and the constant movement of bow-tied waiters balancing dishes and weaving the flambé cart through human and table traffic. It is all a circus, but a most organized one. The program is ambitious, yet fully functional, with an efficiency and balletic precision that can only be achieved through hours and hours of rehearsal. It’s not like Tiger Woods became a great golfer without plenty of practice, the same for why meals at Commander’s Palace flow as smoothly as the gentle evening breeze. The Jazz Brunch on weekends hauls in the crowds for more of a party type vibe. Evenings bring out the dresses, the coats, and the lush lighting to make everyone look like Audrey Hepburn. 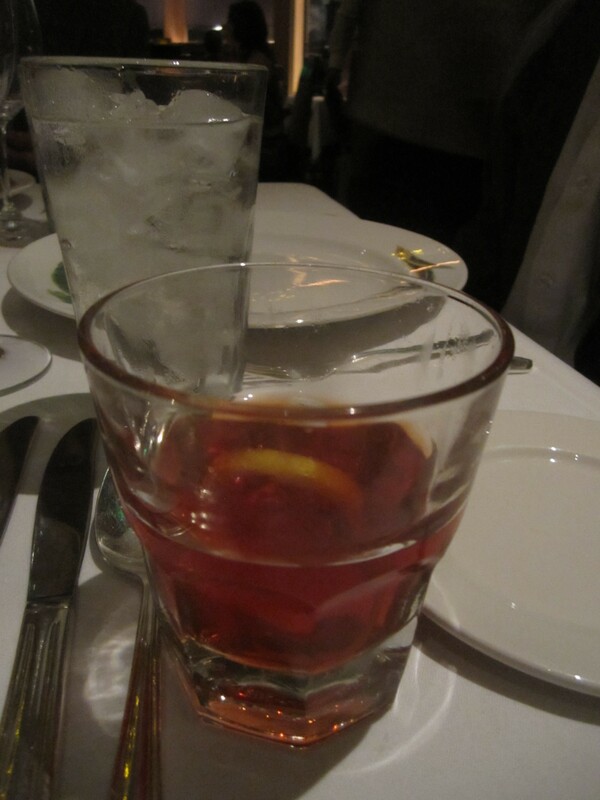 The evening should start with a Sazerac, crafted precisely, with a hint of too many dashes of bitters to turn the drink overly red. Commander’s Palace’s wine list is of the encyclopedia variety, demanding for a sommelier to guide you to at least the right continent section. This is an old fashioned elegance. Put away the iphone. The menu will not show up until a good half hour after you are seated. The lackluster baguette doesn’t show up (not that it needs to in hindsight) until the main plates arrive. The relaxed formal proceedings are very welcome, but do need to at least feature an amuse-bouche for this type of pomp and circumstance. This might sound as stuffy as it may have been a century ago. Commanders somehow achieves that precise balance of gastronomic elegance with all the warmth of a neighborhood bistro. Off the top of my head, I cannot think of a better wait staff at pacing a meal and making you feel truly comfortable at the table. At the same time, this is no neighborhood bistro. There is ceremony. This is a special occasion palace and the staff will let you know it. Our head server, a former captain for Jean-Georges Vongerichten and Daniel Boulud, led the organized symphony of service as if the maestro of the New Orleans Orchestra. Having dealt with far too much obtrusive or lackadaisical service every week, service such as the one performed at Commander’s Palace daily and nightly, reminds diners just how much of a difference the service can make. Of course, one must eat well to appreciate that service. That has never been a faux pas for Commander’s Palace, the breeding ground for many nationally known chefs including Paul Prudhomme and Emeril Lagasse. Yes, Emeril once was just an executive chef, not a television star. Tory McPhail now leads the impressive kitchen, focusing on Cajun and Creole standards with several bright, exciting twists. Like the restaurant itself, the food is far from an antique. Every meal requires a spoonful or five of the luxurious signature turtle soup, full of the meat of our favorite amphibian, with a splash of sherry. 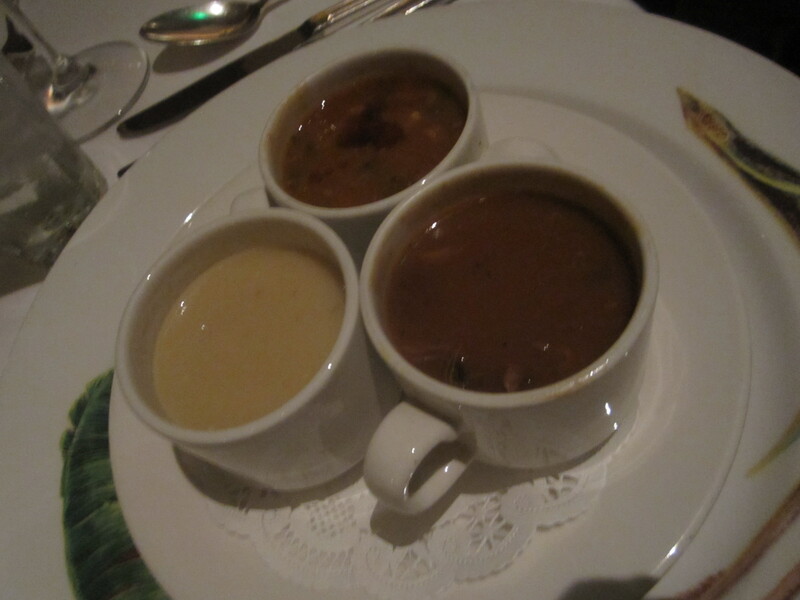 Other soups falter: a bland duck and andouille gumbo, a bisque of crab and brie that tastes of nothing but cream. Better ways to start would be the dramatic pastry dome topped oysters, bacon, and absinthe bisque, or the dynamic pairing of flambéed escargots served over parmesan bread with bone marrow and white truffle veal fond. 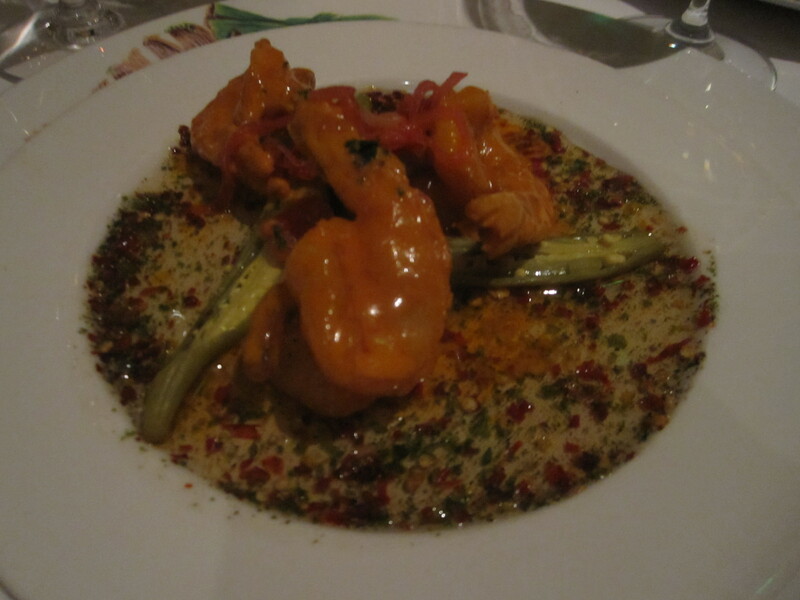 Nobody could resist the exquisite shrimp & tasso henican with the giant, succulent shrimp stuffed with the salt ham, served over a nearly spicy Crystal hot sauce beurre blanc, five pepper jelly, and some fascinating pickled okra. 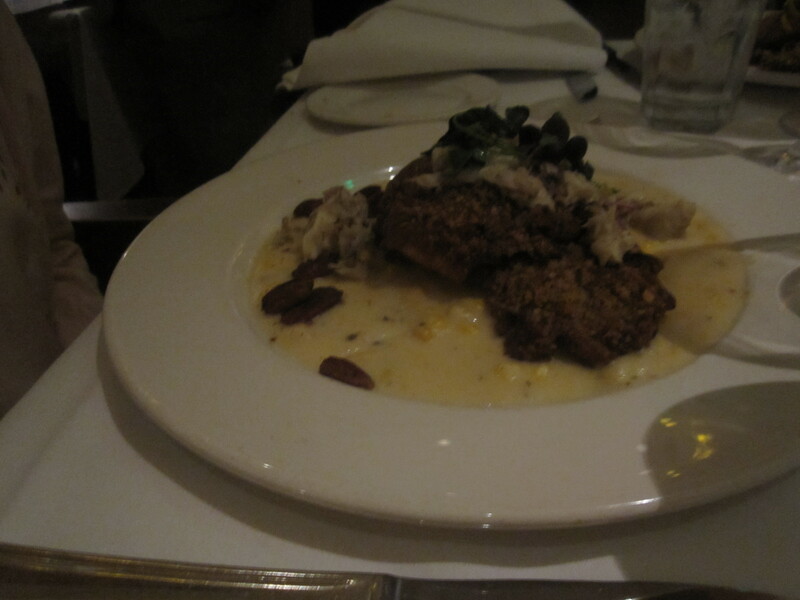 The only abnormally large main plate, a rarity in this city, was the pecan crusted red fish. Fortunately, the fish did not suffer from such a huge preparation. The giant filet thrives in a crust of real pecans, not the mysterious bread crumb-nuts mixture most crusts tend to me. Atop a bed of creamed corn, accented by champagne poached blue crab meat, and cooked to a buttery, flaky texture, the dish thrives. So too did a spruced up, yet down home special of barbeque shrimp and grits. 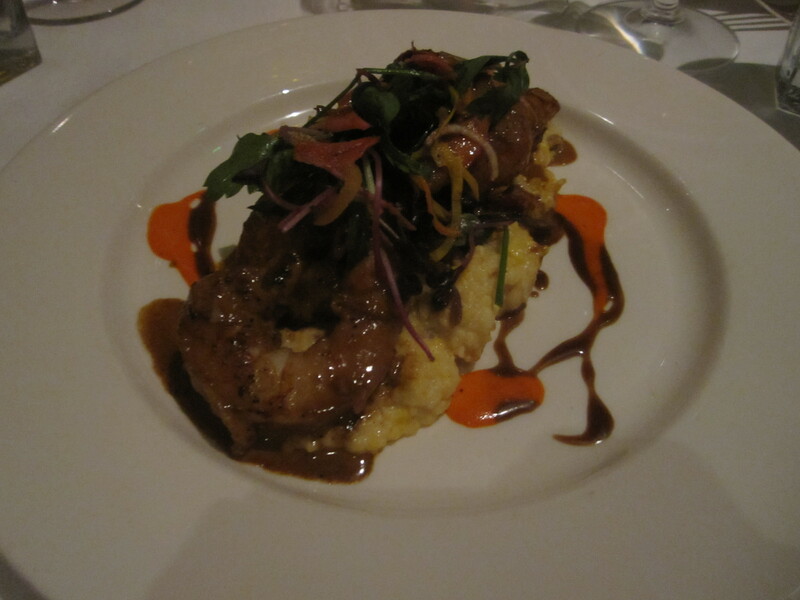 More of those intensely plump shrimp come atop a bed of the most flavorful grits I’ve ever met courtesy of andouille. Crushed lemon, chilis, and an Abita beer barbeque sauce round out the flawless dish. A perfect rendition of comfort food in the hands of an haute cuisine chef. McPhail never is one to stay with the status quo classics. In fact, the innovation may not come from molecular techniques, but instead from daring combinations. They work. 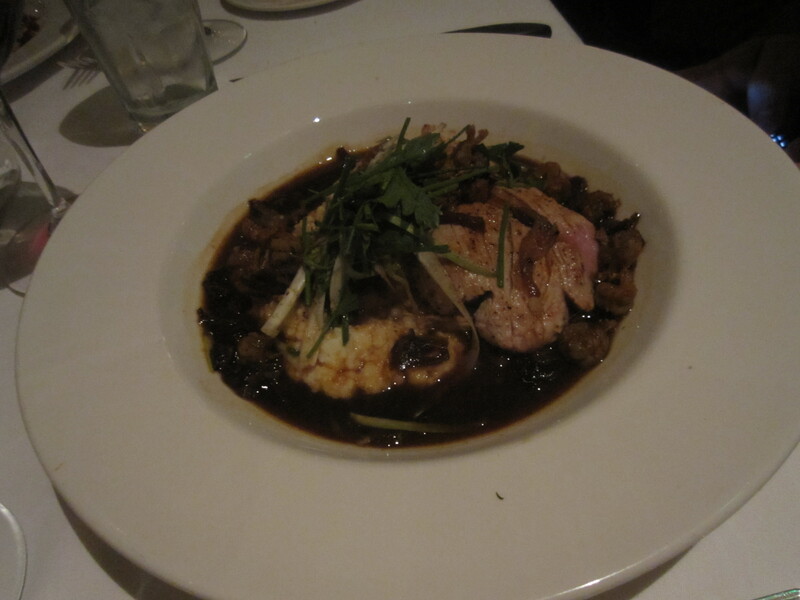 Tender milk fed veal is paired delightfully with a crawfish bordelaise, not exactly a run of the mill combination. Then the veal is placed over goat cheese grits, shaved asparagus, and a ripped herb salad. The dish that is most revealing of McPhail’s prowess would be a duck duo of confit and the tenderest of Muscovy sliced breast medallions crusted with pork cracklings. It may sound like a salt fest, but avoids that fate. Then carefully constructed with a strawberry gastrique, shitake mushrooms, crispy sweet potatoes, and some foie gras enriched rice for good measure, the result is a true masterpiece. Meat, salt, fresh fruit, umami, all in one. Desserts veer more towards the classic. Every table features a textbook souffle, known as the Creole bread pudding souffle. Unfortunately the light as a cloud souffle had no flavor detectable. As light and tasteless as air. 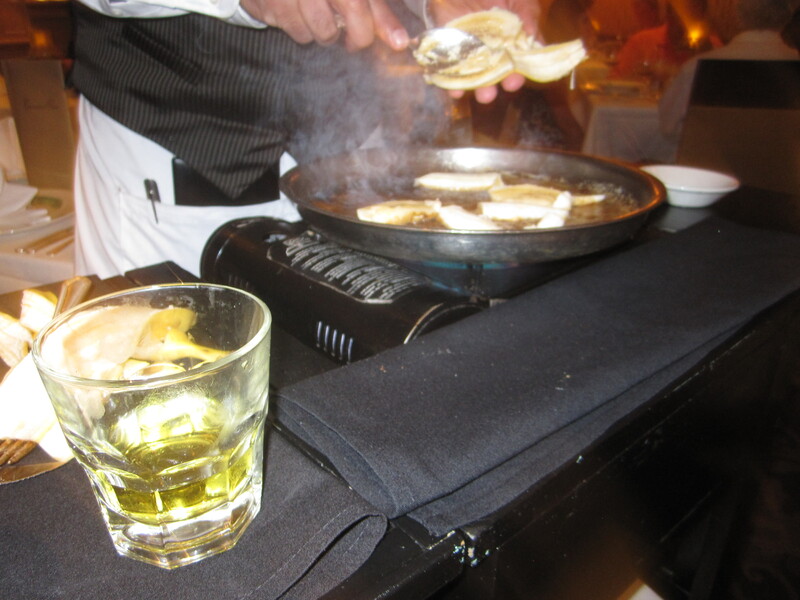 The real show and night capper for the meal is the flambéed Bananas Foster. 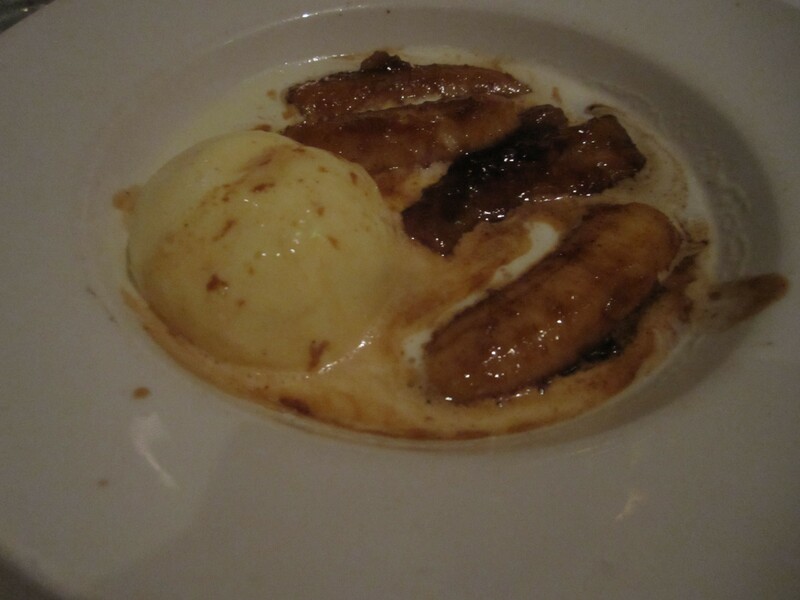 This is as terrific a version as you’ll find these days, in a rum rich sauce, and Commander’s Palace succeeds in keeping the bananas from becoming mush and the ice cream melting into a sauce immediately. Pecan pie and crême brulée are on offer should you desire, as is a chocolate tasting to go with that last sip of cognac or chicory coffee. A truly special meal is such a wonderful experience. From a robust turtle soup to a Michelin star level main plate to a flambé show for the finale, one eats well in this stately palace. What truly sets Commander’s Palace apart is the service. Dining is a special occasion here today, just like in 1880. 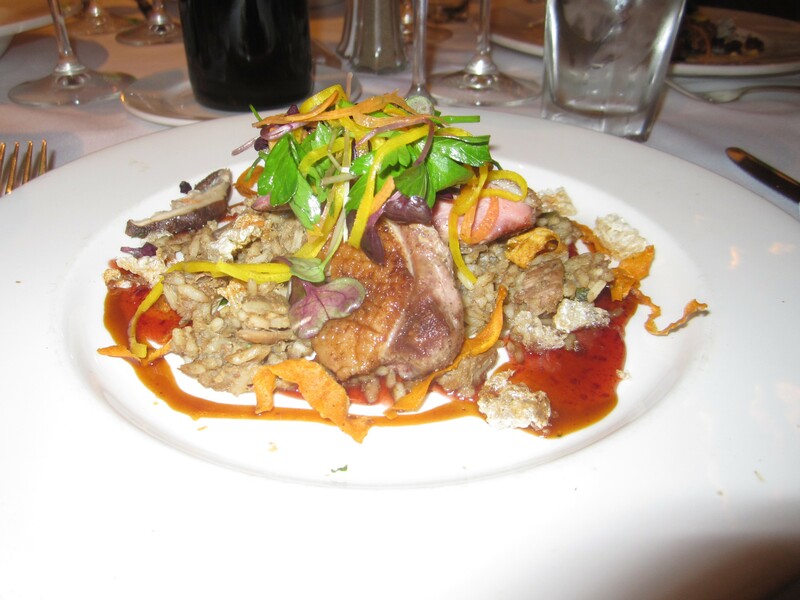 This entry was posted on June 5, 2012 by trevsbistro. It was filed under New Orleans, Restaurant Review .